Native Arabic Voice Prompt Starter set by Yasmine, for FreeSWITCH, blue.box and pbxWare. Native Arabic voice artist with a professional business voice. 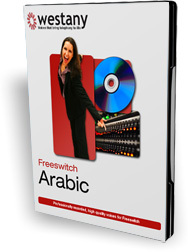 Starter set of Arabic voice prompts for freeSwitch, blue.box and pbxWare. All codec formats included from 8k to 64k. Alaw, ulaw, gsm and other audio file formats created free upon request. Instead of having to record everything yourself, we created these starter sets, comprising over 500 voice prompts, that can be extended by the same voice artist to match your project. We don’t sell a lot of these voice prompts, but we keep them available to help the FreeSWITCH developer community by reducing the costs of starting from scratch. Every time we sell one, we update the set to the latest recordings. If you want to use them in a standard installation, they should cover the majority of the features but it will depend on the last time they were updated. Please get in touch to find out more information. We can of course record anything you need with the same voice artist. Over 500 recorded voice prompts included. The number of voice prompts continually grows as new features get added to and new versions of the software get released. Currently the number of recorded voice prompts is over 500 these include voices for Voice Menus, Call Queues, Call Groups, Dial Groups, Follow me, Call transfers, Call Parking, Voice Mail, Error messages, Conference, Numbers (digits), letters and Phonetics as well as a bunch of other features. All the voice prompts are recorded by Yasmine, who is a native Arabic speaking voice artist. None of the recordings are generated by a text to speech engine (tts) or cut-and-pasted together. So you won't hear a synthetic or unnatural sounding voice. Yasmine has been professionally recorded in our studio to achieve the maximum quality of both audio fidelity and correct pronunciation and inflection. To maximise the number of simultaneous calls you can make and extract the full power of FreeSWITCH, our voice prompts are provided in multiple sound file formats which automatically match the needs of your installation. We provide the entire set of recordings in all the wav formats supported by FreeSWITCH as well as other formats including alaw, ulaw, gsm, sln and mp3 on request. All of these formats can be installed at the same time and allow FreeSWITCH to match the voice prompt format to the format of the call. This removes the need for any live transcoding leaving the full power of the computer to handling calls. Yasmine can record any additional voice prompts to customise your installation. If you need specific announcements or custom IVR messages we can have them recorded and edited exactly to your specification and match the delivery, pace and pronunciation of the rest of the voice prompts. This ensures a seamless telephone experience for yourselves and your customers. All of the voice prompt formats, from 8kHz to 64kHz, are provided in individual installable archives. This allows you to install the formats that you want, without having to use them all.